Situated on Hong Kong’s Hollywood Road, Input/Output (I/O) is not a usual kind of gallery with ink paintings, sculptures and canvases on display. Instead, being the only gallery in Hong Kong that is primarily focused on promoting new media arts, it is set to de-marginalize the “quirky” art genre through facilitating critical exchanges about it in exhibitions, workshops, talks and meetings with artists. Glass-fronted, the small gallery has been successful in attracting a wide range of visitors, from curious passers-by and tourists to students, curators, artists and professionals from various fields, to gather and have conversations about new media arts. Having been open for a year, the gallery has held several exhibitions which showcased new media works of art graduates and practitioners mostly from Hong Kong. Presenting Chinese graduate artist Lu Yang’s “A Torturous Vision” this year, the gallery has inspired debates in Hong Kong that question the definition of new media arts and how it binds science, art and technology. Art Radar Asia spoke to Rachel Connelly, Assistant Creative Director of I/O, to find out more about the background of the gallery and its ambitions going forward. It’s funded privately – by sales. Why is I/O situated on Hong Kong’s Hollywood Road? I think when I came on board, this had already been decided. 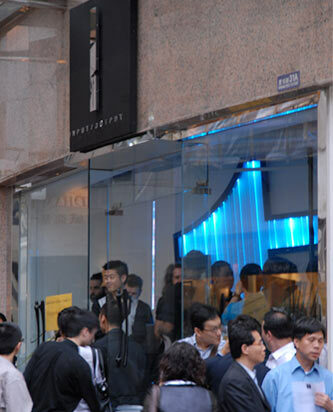 But it’s a very central location – obviously Hollywood Road is known for its art galleries. We are providing something unlike the commercial spaces that focus more on traditional arts, so we try to provide something very different. We also have the advantage of having a glass-fronted space; people that walk by are very intrigued by what we do. What led to the establishment of I/O? The gallery is a platform for new media arts. It is owned by a new media artist, and having realised that there are not many platforms here in Hong Kong for exhibiting new media arts, he wanted to provide a space to promote them. He’s from Hong Kong. Why is new media art interesting to you? Being new to Hong Kong and completely new to media, my background was non-profit art-spaces and contemporary visual arts, but not necessarily new media. New media is a new term, a new genre and I wanted to explore that. There’re obviously a lot of new media artists in Hong Kong, and in China more so, but it is a new genre, too. To me, it’s interesting what it is that defines new media, and what makes it different from just being termed ‘sculpture’, ‘installation’ or mixed media work. So it is also quite interesting to discover what this term means to artists. It is not our role to give the answers to these questions; our role is to create dialogue around new media art practice and provide exhibitions that ask questions about that. Coming from England, the idea of coming to Hong Kong and China, to where new media art has a great reputation outside itself, was exciting; it is something that artists are really interested in here. Is the new media art market doing well in Hong Kong? As I saw it, new media occupied a slightly marginalised and kind of quirky position. It needed to almost come to maturity and stand up for itself as a new genre. The way I saw to do that was to place it within contemporary arts and the conversation around art practice. So everything that is shown in the gallery needs to be asking these questions; it cannot just be about the technology. I think in terms of the Hong Kong market, the art that is bought here is still very traditional. What has the I/O done to promote new media arts? Within a year, we’ve literally been in a position of educating people about new media arts, and we have done this by providing them with exhibitions that will show them examples of that. This is still very new, and so we are also telling people how it is possible to actually buy all these objects, by providing them the equipment necessary to show these works in their homes. We will also help to install it. Last year we were kind of in a position of educating about new media – because people are still very traditional here in terms of art buying. People buy paintings and sculptures mainly. Last year we raised a lot of interest by having a lot of different shows ranging from film works and CG animation to even the canvas … we have created a lot of interest in terms of questioning the genre. What do you think the “traditional arts” in Hong Kong are? It’s canvas, ink paintings, sculpture, etc. Who are the people that I/O wants to “educate”? It’s not really educating but promoting, getting people to be aware of what you’re doing and also to encourage people to switch their focus from more traditional arts to new media. And so it’s just the idea of making people aware that it is there – not necessarily a role, but a position that we find ourselves in, which is fine because that’s still exciting. How does I/O decide what to show and what not to show? It is a selective process, project-by-project. We are selecting artists from the world of new media, but then, like I said, it depends on what you see as new media or what artists within the genre, see that to be. I wanted to get away with the idea that it’s just about technology – even if that is important … it’s a new tool, which is fine, but it needs to stand up in terms of content. 'Experiments on the Notation of Shapes' by Joao Basco Paiva is an audio visual installation where architecture is translated into sound, creating a fictional sonic expression of Hong Kong's cityscape. Is there something that I/O would not show? Are there any examples of new media art that it wouldn’t show? Have you got a definition of new media arts? Because I haven’t. It is still being decided and that is why it’s very exciting. It is at a very raw stage. It’s what I have been saying – encouraging conversations around what new media arts are. It’s not about definite answers; it’s about discussing what the genre is. Some people think that it’s about software; some people think that it is CG animation; some people think it is interactive self-generative programs. In the case of Lu Yang she has two canvases of her series of five, and this adds to her conversation around bio-art and what that is; I was intrigued about that and wanted to have those conversations in the gallery. So in this case, canvases fall under that. Primarily, it’s about discussion. So you think that there shouldn’t be any boundaries to art? Art is about questioning the boundaries, whatever they are. It’s not necessarily an artist’s role. If you are asking me about censorship, that’s a different question, I don’t think there should be censorship, no. Why does I/O choose to show Lu Yang’s “A Torturous Vision”? From the beginning I felt that it was necessary for I/O to create a dialogue around what new media is, in order to raise it out of its slightly marginised state, to raise awareness of new media as a genre, and almost ask it to ‘stand up’ for itself, within a contemporary fine art context. It means different things to different artists here in Asia, and even more different to artists in Europe. All our exhibitions have been trying to create a conversation to discuss what these might be. An example was an early exhibition, “New Media, New Thinking”, which was in response to a call out that I did among artists living in Hong Kong. Proposals came back from very different artists, and I chose three that seemed to all agree that new media had central main themes around interactivity, and also the use of technology. One was quite a traditional medium actually – film, but questioning the medium itself. By placing the participant directly between the projection and projector, he is questioning the audience’s interactive role within the work. The second piece, by Evan Roth, was a 3D graffiti app for an iPhone, who said the interactivity for his work couldn’t be any larger than the internet community that views it – he actually uploads all his work using open source software, and then it is available for you to download for free. The third piece was animated paintings, based around German Abstract Expressionism and ink paintings, but here the artist asks you to interact just by spending time with the work, letting your subconscious unfurl. These three different approaches interested me [as] to how new media is being used by artists today. We then showed works by Portuguese artist Joao Vasco Paiva, which used complex programming to create a self generative orchestrated score for two projections focusing on Hong Kong cityscapes. Lu Yang was as intriguing as she falls loosely into a genre, which is much larger in China, called ‘bio-art’ and this interested me in terms of the discussion around art and science. What has been the reaction to Lu Yang’s “A Torturous Vision” so far? Great. It’s intriguing; it pushes all of your buttons. It is an exhibition of extremes. All the artists inspire you in different ways. We have had different people across the board coming in, from science academics, to people visiting Hong Kong and walking past, to artists who came to hear the recent talk by the artist herself. I/O is also running an off-site project. What is that about? I/O Off-Site is a way of promoting new media arts in a more public context; it’s also a more commercial project. I still feel that new media arts are still very marginalised and therefore by promoting the media in public places, in interesting developers to use new media arts to show in their buildings, not only continues the conversations, but then in reality we can get media artists jobs! Artists need to survive. How is I/O different from other galleries in Hong Kong? We are a commercial space, but we are solely focused on the study of new media. We also run more on a project-by-project basis, as opposed to having a stable of artists that we represent…. 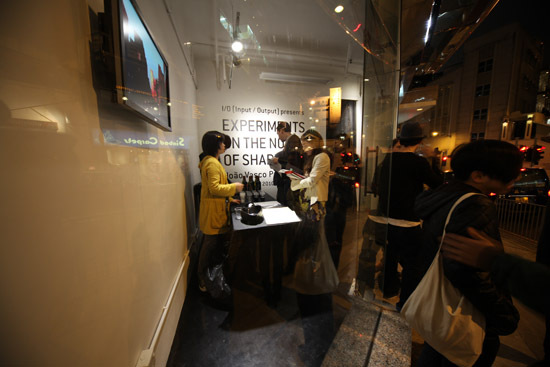 We are solely promoting new media arts, but we also offer an events programme that runs along the side our exhibitions. That makes us very different from most commercial galleries. Non-profit organisations like AAA and Para/Site may have this, but not many others commercial galleries. But we saw it necessary to continue the conversation, not just through exhibitions but around talks, events, music programming, film screenings; all these different events are about encouraging the discourse. What does I/O want to accomplish in the Hong Kong art scene? The idea of promoting new media arts and artists, to get it on the map. To provide a platform solely focused on this. What has been the development of I/O so far? In a year, I feel that in terms of people knowing about us, what we do through our exhibitions and events programme, we have achieved a lot. We are trying different things and providing programs of varying interests. This year we’ll go into our Off-Site project – that’s a whole other exciting year to come. How is I/O going to develop? The first year we worked with primarily artists that lived in Hong Kong; the second year is about exploring further into China and Asia. Off-Site projects will be more of a focus too, and this will be artists from all over the world. Future development will be concentrating on taking new media outside the traditional white cube. Art Radar Asia recently published an overview of young Chinese artist Lu Yang’s controversial bio-art exhibition “A Torturous Vision” – read it here. This entry was posted on July 8, 2010 at 2:35 am	and is filed under Business of art, Definitions, Hong Kong, Interviews, Medium, New Media, Promoting art, Venues. Tagged: 3D art, A Torturous Vision, animation art, app art, art conversations, art development, art genre, art graduate, art platform, art promotion, audio visual art, canvas, Carmen Bat Ka Man, Chinese new media, computer art, contemporary art, Evan Roth, exhibition, Experiments on the Notation of Shapes, funding, gallery shows, graffiti art, hong kong, hong kong gallery, I/O, I/O Off-Site, ink paintings, Input/Output, Interactive art, Joao Basco Paiva, Joao Vasco Paiva, Lu Yang, new art trend, New Media, New Media Art, New Thinking, Rachel Connelly, science, sculpture, Sound art, Technology. You can follow any responses to this entry through the RSS 2.0 feed. You can leave a response, or trackback from your own site.